Up until 1988, overseas travel was not liberalized in South Korea, which means that people who wanted to go abroad or foreigners who wanted to enter the country required special approval by the government. At the time, infrastructure, the culture of appreciating leisure activities and the wealth of local people were underdeveloped. For this reason, the South Korean tourism industry has been predominantly sustained by domestic travelers. In contrast to the past, the number of South Korean outbound travelers amounted to approximately 26.5 million in 2017. 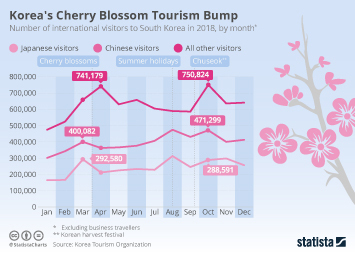 Except for the period of economic recession from the late 1990s to the early 2000s, South Korea's balance of trade from tourism has been in deficit due to a lot of citizens traveling to other countries. It may gradually change in the future since there has been a growth of foreign tourist arrivals in South Korea. Some factors have enhanced South Korea's standing as a tourist destination among the international community. These include the Korean Wave and the host of a massive sports events such as the 2018 PyeongChang Winter Olympics. Accordingly, the total contribution of travel and tourism to GDP of South Korea has been increasing. The popularity of tourism calls for the development of the lodging industry in South Korea. Over the past few years, there has been an intensive demand for and consequent supply of hotel rooms, especially in touristic regions like Seoul and the capital area as well as Jeju island. Moreover, new types of accommodation services, Airbnb and Yanolja for example, have experienced rapid expansion. This can be illustrated in the fact that Yanolja managed to receive two of the largest single investments for South Korean startups in 2017. South Korea has witnessed more and more tourists visiting for specific purposes. Admission to a casino is generally prohibited for South Korean nationals, but not for foreigners. Thus, hotels have competed to attract customers from abroad, combining resort facilities with accessibility to casinos. On the other hand, medical tourism has also been under the spotlight. As the country takes its position as home to beauty in Asia, relevant medical procedures and non-surgical treatments have been favored by service users. In terms of domestic travelers, there has been a recent boom in camping and outdoor activities. As opposed to international travelers, who are prone to go sightseeing at popular tourist spots, locals have the tendency to spend their leisure time in less populated regions. According to survey results released by the Korea Tourism Organization, both medical tourists and Muslim travelers were highly likely to be satisfied with the overall tourism environment in South Korea. Notwithstanding their willingness to recommend the country as a travel destination to others, many visitors from Islamic countries suggested a broader provision of halal food and religious facilities as improvements for Muslim-friendly tourism.